The Norfolk Coast Area of Outstanding Natural Beauty is a protected landscape in Norfolk, England. It covers over 450 Km2 of coastal and agricultural land from the The Wash in the west through coastal marshes and cliffs to the sand dunes at Winterton in the east. 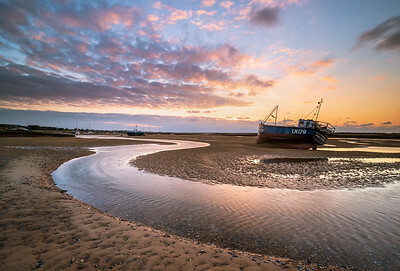 A fishing boat next to a winding river through the sand during sunset at Mow Creek, Brancaster Staithe. The old coal barn at Thornham at high tide. 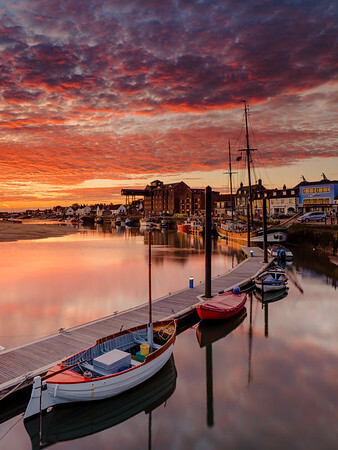 A stunning autumn sunrise over the harbour at Wells-next-the-Sea. 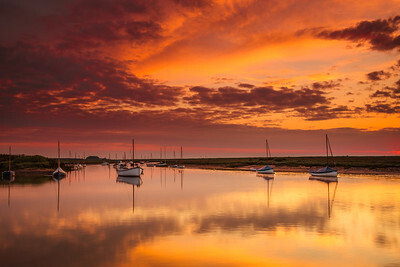 Three small boats tied together at sunrise at Morston quay. 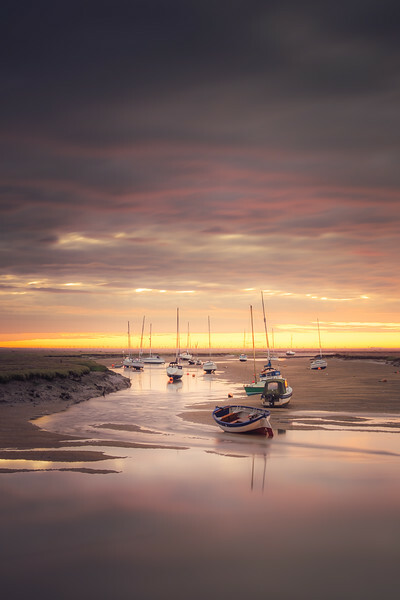 Boats on the sand banks in Wells harbour at sunrise. 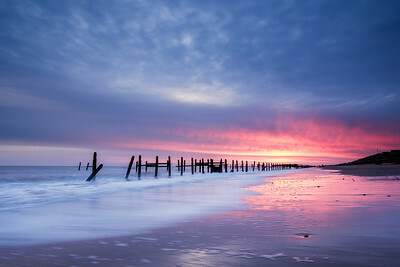 Looking along the beach at dawn at Happisburgh in Norfolk England. The shattered sea defences at Happisburgh Norfolk. 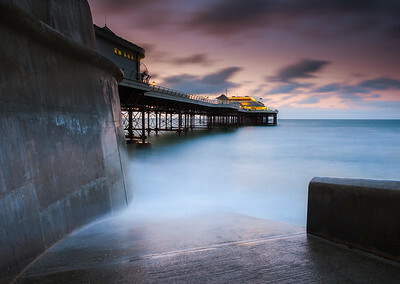 Cromer pier at dawn. The wave caught as it drawers back across the pebbles. A metal groyne zig zags into the sea on Caister beach. High tide at Morston quay. Black and white image of the boardwalk on Cromer pier. 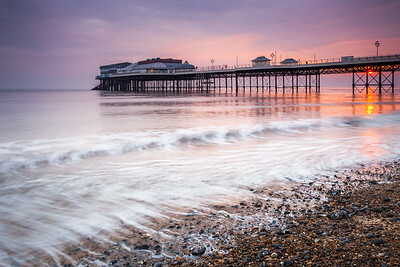 Cromer pier and beach at sunrise on a winters morning. Waves and rocks on the beach as the light briefly breaks through the clouds. Beach huts amonst the grassy dunes at Old Hunstanton. Serene sunrise over the wind farm of Caister-on-Sea. 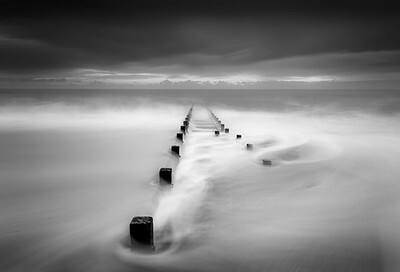 Storm clouds over a groyne at Cart Gap on the Norfolk coast. Calm waters of a high spring tide a Thornham. The remains of long dead trees in the water at Thornham during high tide. Lines curving through a field of barley towards a red and white stiped lighthouse. Sunrise from the dunes overlooking Sea Palling beach. Cromer pier at high tide seen from the slipway. 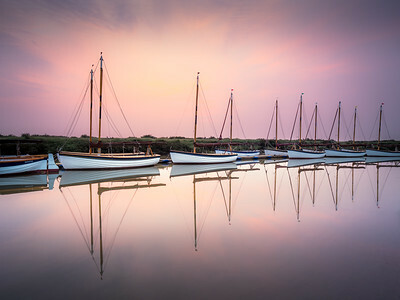 A line of identical sailing boats at dawn on a calm spring morning. 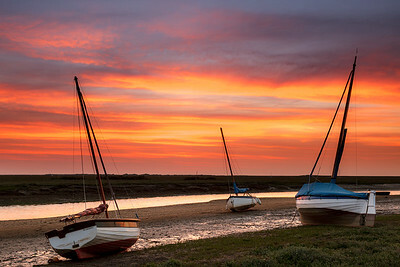 Fishing boats on the Blakeney estuary at sunset. A wooden jetty at high tide at Thornham. 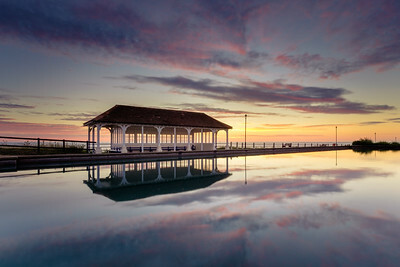 A firery sunrise over the boating lake on the promenade at Sherringham. The remains of two tree trunks in the sea at Thornham during high tide. Two metal railings in the sea at high tide. Sunrise over the beach huts at Old Hunstanton. The last river of water runs off Wells beach at low tide. Cromer pier from the slipway at high tide on a summers evening. A fishing boat and tree reflected in the calm waters of a high tide. 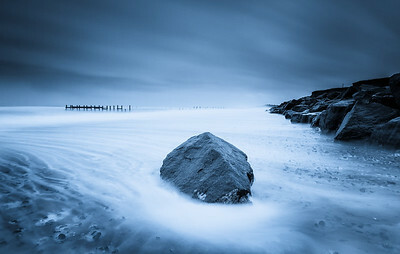 A single rock from the sea defenses surrounded by the rushing waves. Calm waters of a high spring tide at sunrise. Sunrise over the salt marshes near Wells.